If you are happy picking colours using a graphics program or online tool then you can skip this if you want to. It might be useful though, especially if you struggle to pick colours which will work together as the colour wheel is the basis for many of the words you will see when picking good colours. You should be able to see that red, green and blue are there each a third around the circle from the other. Look half way between any two of the primary colours and you should see another colour. These are mixes of the two primary colours. Look for red and blue and half way between them is magenta (the pinkish one). The same for yellow and cyan. The remaining colours are the same - between magenta and red is a reddish magenta colour! 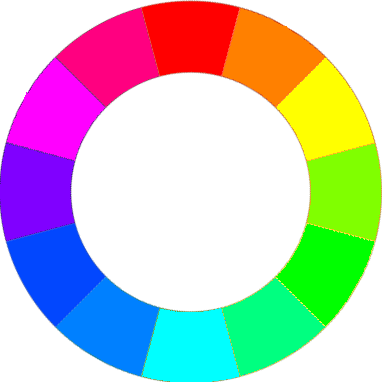 If you keep mixing the colours like this you end up with a wheel which has every possible colour in it and you could click on any colour (or hue) to pick it. The value can be expressed in degrees (yellow is one sixth of the way around the 360° wheel so has a value of 60°). It can also be expressed as a percentage where yellow would now be 16.667% which seems a little clumsy.